Travel car-free on the Amtrak Downeaster to Kennebunkport where we offer pet friendly establishments such as the Captain Jefferds Inn or the the Yachtsman Lodge. Along with your two-night stay, you and your pet will "em-BARK" on a Doggie and Me Foodie tour of the local area. Perhaps your pooch would love to check out the cuisine that Kennebunkport and Lower Village have to offer as well. 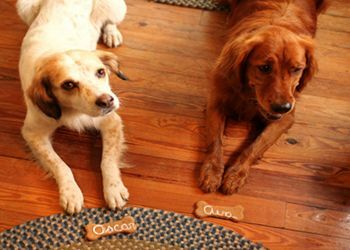 You will make five stops to enjoy doggie treats and good eats! Profits from this fun tour will be donated to the Animal Welfare Society of West Kennebunk. Don't have your dog with you this visit? You can still join us for the tour at the same price and take home the treats. Tours are offered every other Saturday throughout the Summer months. Our transfers in Hydidrive's vintage woody wagons will also be a special treat for your weekend. **Overnight rates are per person based on Double occupancy and are subject to availability at the time of booking. Pet friendly rooms vary by property and we highly recommend booking as far in advance as possible.